Everybody loves a facial once in a while, ideally monthly to ensure your skin is kept deeply cleansed and hydrated so I decided to try out the new Darphin facial at The Chelsea Day Spa and thoroughly enjoyed it. I loved the location, it’s just off the Kings Road in what appeared to have been someone’s home, so it had lots of stairs and a lovely homely feeling about it. I was shown to a treatment room and the facial began. A welcome ritual – massaging my feet and neck – was a great way to relax. Then my face was cleansed, toned and exfoliated. Serum and eye gel were applied and the youthful radiance camellia mask was applied. It smells divine and made me feel totally relaxed. While the mask was on, a hand and arm massage was performed, and to finish eye and face serum were applied. My skin felt really fresh, soft and hydrated. The Chelsea Day Spa is a real hidden gem and an oasis of comfort in the hustle and bustle of the Kings Road. It really is the perfect treat for yourself or a friend. The Chelsea Day Spa opened in January 2009 on the fashionable Kings Road in the heart of Chelsea. It’s spread across 2 floors in a townhouse building and has 2 treatment rooms, an express bar with 2 pods, and a nail bar with 4 stations. 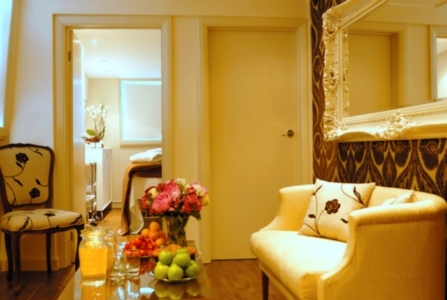 It offers services such as waxing therapy, massage therapy, nail therapy, body treatments, spray tanning and facials. This entry was posted in Skincare, Wellbeing and tagged Chelsea Spa, Darphin, facial, glowing skin, Hydration, Kings Road, softness. Bookmark the permalink.